The worry about the indiscriminate use of the terms cypsela and achene for the fruits of Asteraceae has been frequently detached by specialists in this family. The present work was developed aiming to verify the existence of arguments to justify the adoption of a term against the other. After historical and anatomical analysis, we concluded that there is technical basis to consider cypsela and achene as different types of fruits. 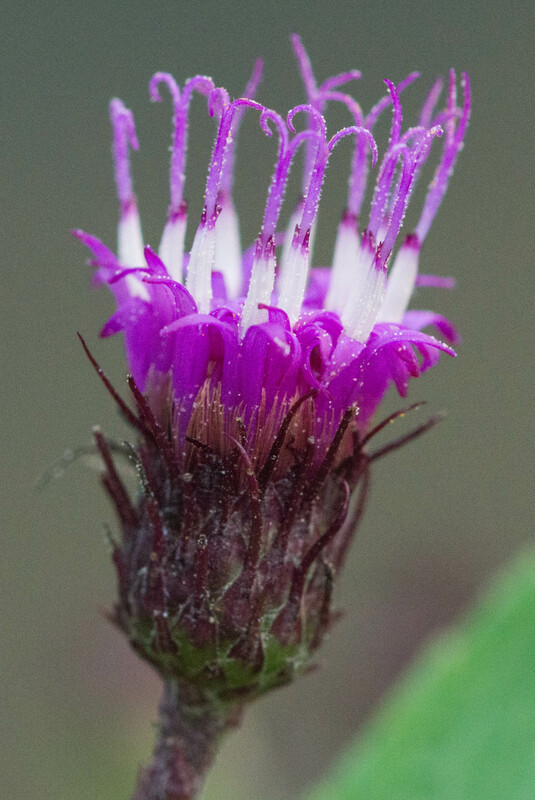 For Asteraceae, the correct is to call cypsela; achenes are only derived from superior ovaries, as in Plumbaginaceae. 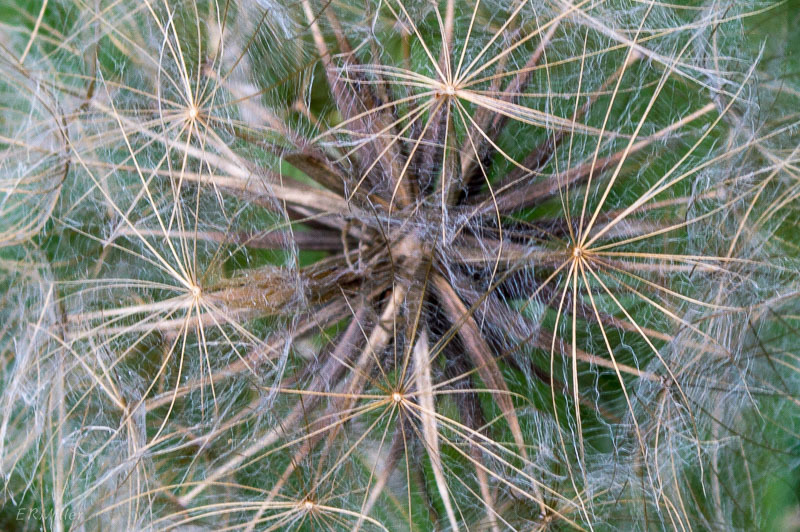 At any rate, picture a single small seed with a tuft of hairs, like dandelions have. There are three types of aster family flower heads, named according to the type(s) of florets present. If both types of florets (ray or ligulate and disk) are present in a head, the arrangement is termed radiate. If a head contains rays only, it is called ligulate. And if only disk florets are present, a head is called discoid. Another characteristic of aster flower heads is the presence of phyllaries. 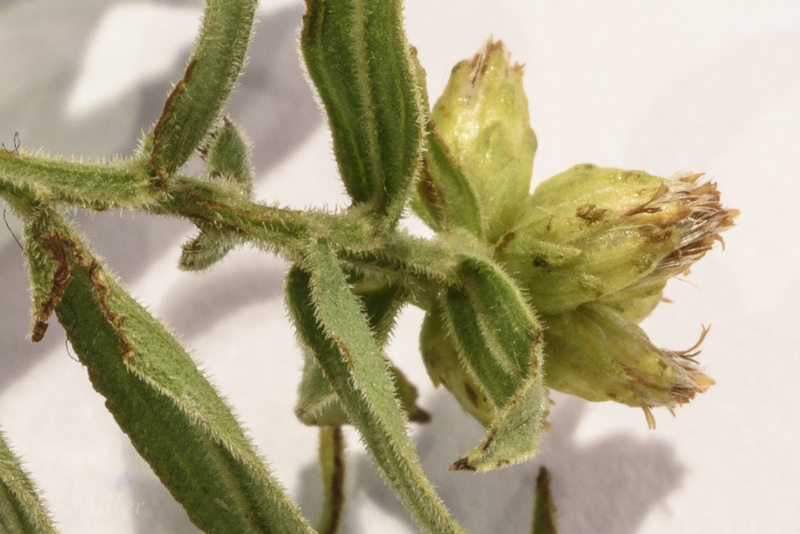 At the base of a flowerhead there’s a whorl of bracts (modified leaves), called an involucre. In aster family plants only, the individual leaf-like structures are called phyllaries. 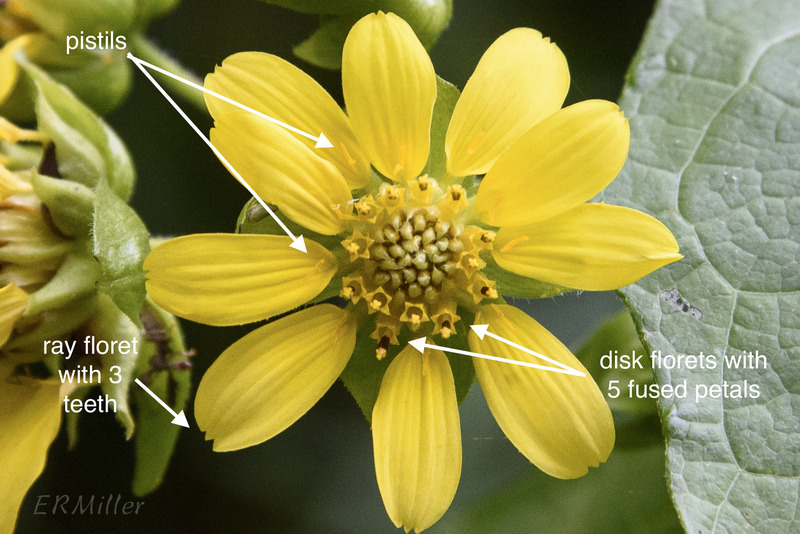 The number of phyllaries, how they’re arranged (how many rows), the shape, presence of hairs, and other fine details are characteristics used to distinguish certain species from others [see this recent post about tickseed]. 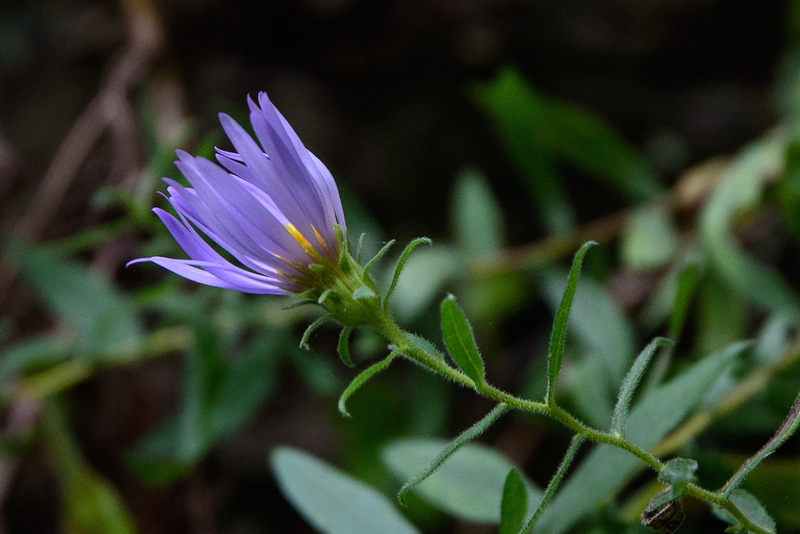 Aster family flower anatomy gets complicated and the subject is full of jargon. Here’s a photo-illustrated primer. 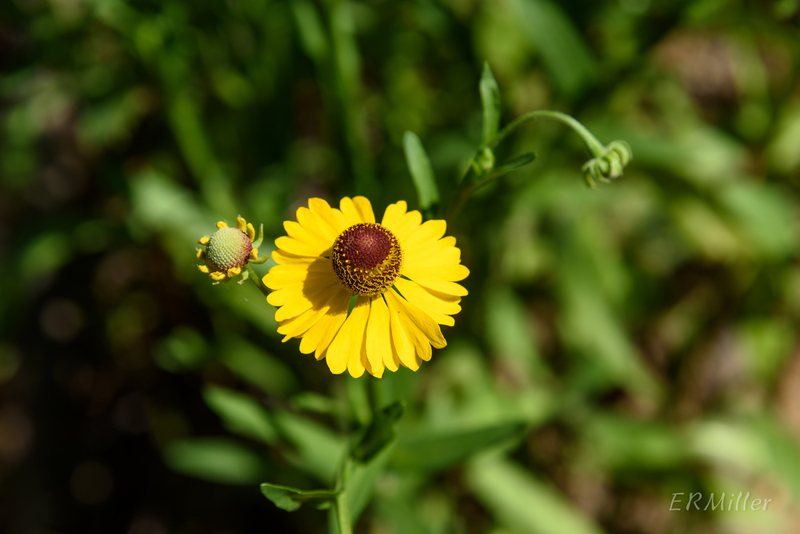 is Helenium flexuosum (sneezeweed), with one open head and one still-developing head. What appear to be yellow petals are actually individual ray flowers. If you click on the image and zoom in, you can clearly see several individual flowers at the bottom, each one three-lobed. The purplish, nearly spherical center part is composed of disk flowers. The ones on the bottom half are open, with two-parted stigmas protruding, while the upper half holds still-closed buds. “Ray flower” is a general term. There are actually two different types of rays: ray florets and ligulate florets. Both are tubular-shaped at the bottom, and flatten out towards the top. Ray florets can be sterile or pistillate (that is, female*), and have 2 or 3 teeth or lobes at the end, Ligulate florets are perfect (that is, bisexual: containing both male and female parts*), and often have 5 teeth or lobes. The central flowers in a head are called disk florets. 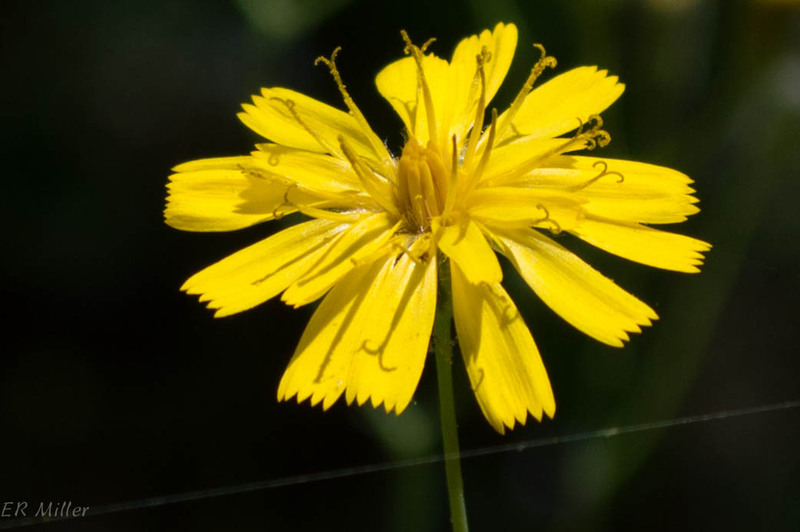 These consist of five petals fused together, so that they look like a single five-lobed tube; the stigma often protrudes, sometimes dramatically. The central disk can be more or less flat to almost spherical (as in the first photo). From golden ragwort in April to goldentop in October, about one in five flowering plant species that I find in the Maryland Piedmont is in the aster family. It’s unknown how many plant species there are altogether: discoveries still happen, and of course there’s taxonomic uncertainty. But experts believe that there are about 352,000 flowering plant species (angiosperms), and of the other major plant groups, there are an estimated 1,000 species of conifers and conifer allies (gymnosperms), 13,000 species of ferns and fern allies (pteridophytes), and 20,000 species of mosses and liverworts (bryophytes). [The Plant List]. 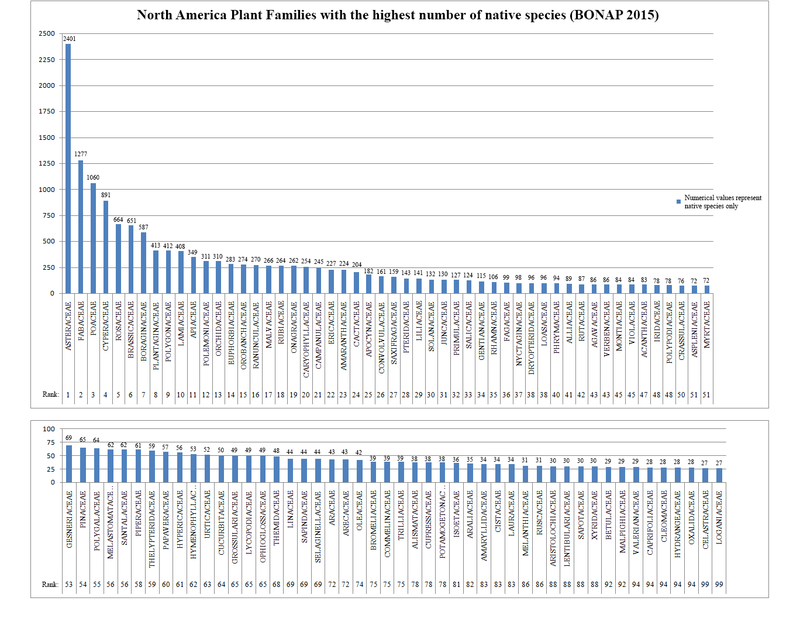 So it’s probably safe to say that flowering plant species outnumber all other plant species combined by an order of magnitude. Of the flowering plant families, the Asteraceae is probably the largest with about 23,600 species in 1,620 genera. [Encyclopedia of Life] Whether or not it actually is the largest depends on the current state of taxonomic science; the other contender is the Orchidaceae. 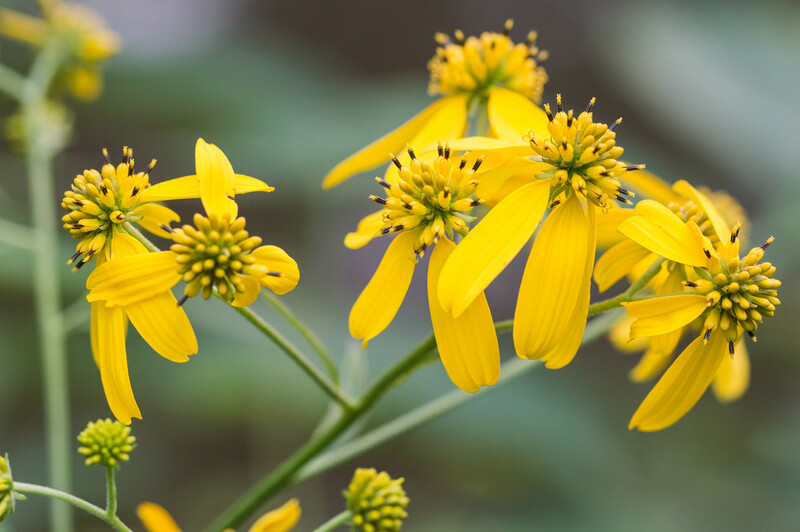 There are 2,401 native Asteraceae species in North America. 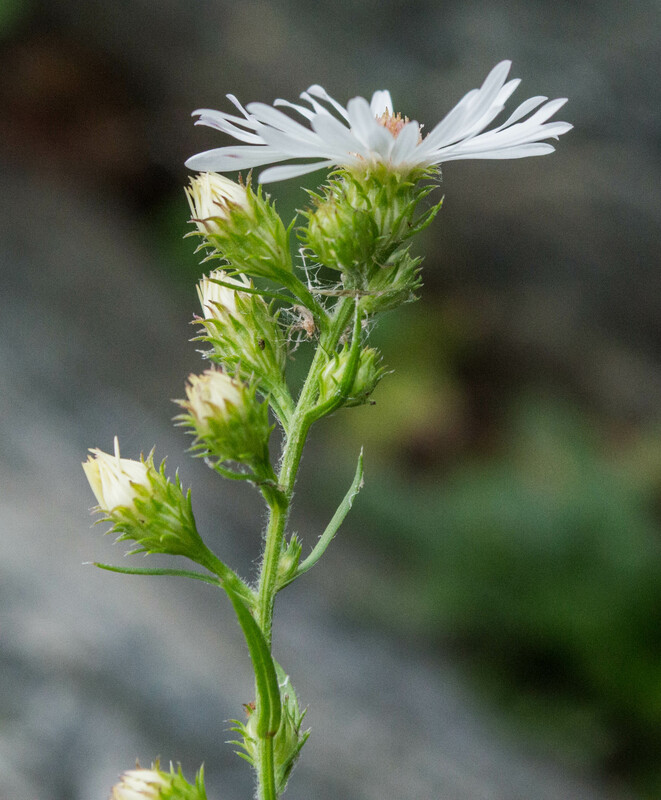 [BONAP] The Maryland Biodiversity Project lists 373 Asteraceae species (native and alien) in Maryland, and by my very rough estimate, about half of these can be found in the Piedmont. How many flowers do you see? If I zoom in I can see about 21, not counting the unopened buds. Wondering how that can be? Here’s a clue: an older but still accepted name for this family is Compositae, or composites. Plants in this family bear heads that appear to be single flowers, but these heads comprise from several dozen to several hundred individual flowers. 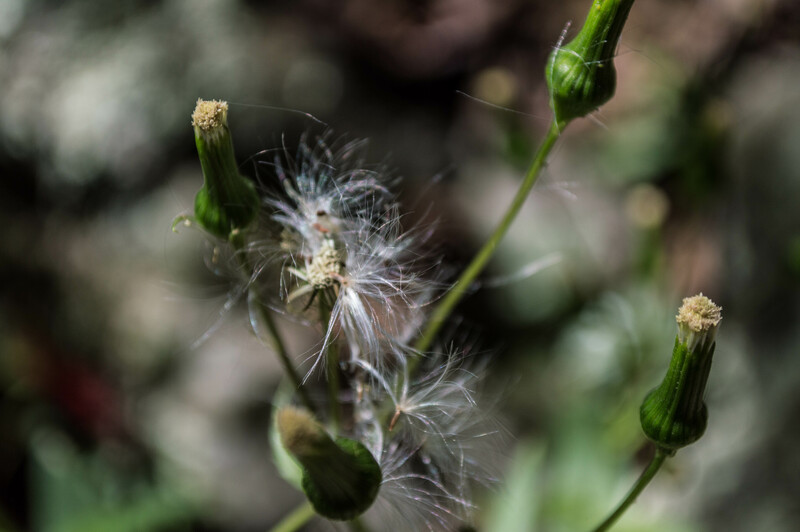 This post is dedicated to my friends Cheryl and Barry, who independent of each other gave me the idea to write about plant families during the dormant season. We haven’t had a hard freeze here in the Piedmont yet this season, but what with the drought and cooler weather and shorter days, the wildflowers are just about done for the season. Normally this is when I put my blog to bed for the winter, but this season I’m going to try to keep it going by writing about related subjects. And it occurred to me that I mention the Piedmont a lot, but have never really explained what the Piedmont is. So here’s a little primer. Maryland is a complicated state, geologically speaking. From west to east, it measures about 250 miles, and includes five physiographic provinces. (A “physiographic province” is an area of similar landforms.) The combination of underlying rock formations, elevation, and climate gives each province its own character. The westernmost of these is the Appalachian Plateau, in Garret County and the western quarter of Allegany County. It consists of folded strata of sedimentary rocks. Maryland’s highest point is here: 3,360 feet at Backbone Mountain. To the east of that is the Ridge and Valley province, in Allegany and Washington Counties. It also consists of folded sedimentary rock. Here, though, differing resistance to erosion has allowed the formation of long ridges and valleys, including the very wide Great Valley section, which ends on the east with the next province, the narrow Blue Ridge in the easternmost part of Washington County and the western third of Frederick County. The Blue Ridge is one big anticline (with sub-folds) of metamorphic rock. The mountain tops are largely quartzite, highly resistant to erosion. Continuing east, the next province is the Piedmont, an area of hills and valleys underlain by complex folds and domes of metamorphic and some igneous rock. The Piedmont is in Frederick, Montgomery, Carroll, Howard, Baltimore, Harford, and Cecil Counties. The Piedmont is bounded to the east by the Fall Line, where the metamorphic rock gives way to the unconsolidated sediments of the Coastal Plain. That’s right, the Coastal Plain isn’t really rock, it’s just sand and gravel that’s been carried downstream and deposited. In Ocean City the sediment layer is 8,000 feet thick! Fall lines define geological boundaries between uplands and lowlands, and are characterized by waterfalls. Sometimes the areas will be referred to as fall zones, when the transition is not as dramatic and more likely to be characterized by rapids than waterfalls. Think of Great Falls, which is not a single plunge over a cliff, but rather a series of falls (none more than 20 feet tall) totaling a 76 foot drop in elevation over two thirds of a mile. Historically, seagoing vessels could travel no farther west than the fall zone, and that’s why cities were established there: Philadelphia, Wilmington, Baltimore, Washington DC, Richmond, Raleigh, and so on. Interstate 95 runs mostly just to the east of the fall zone. Botanically, the Piedmont (“foot of the mountain”) is a really neat place. Plants don’t always recognize physiographic province boundaries. Some species are very particular in their growing conditions and will only be found in specific places, while others are generalists and can be found everywhere. 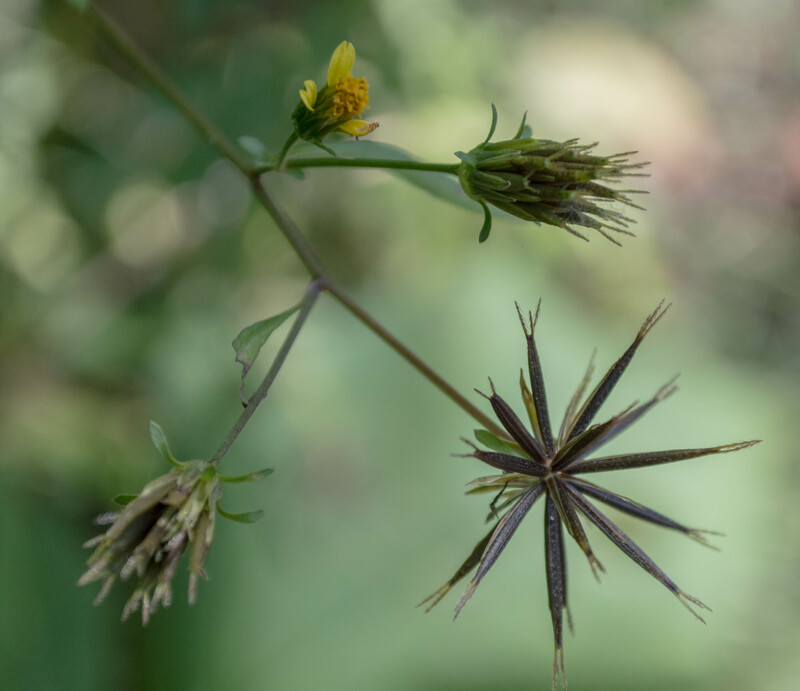 In the eastern Piedmont you’ll sometimes find plants that are mostly limited to the Coastal Plain, and in the western Piedmont you’ll sometimes find plants from the Blue Ridge. There’s a lot of floral diversity in the Piedmont. The day after writing the previous post, I returned to Serpentine Barrens Conservation Park armed with a 10X lens, a small knife, a ruler, a notebook, and most important, a printout of page 1126 of the Flora of the Southern and Mid-Atlantic States by Alan S. Weakley, determined to key out my unknown goldenrod species. Success! I keyed it out in the field, but collected a sample to photograph at home with the macro lens. If you’re interested in how botanical keys work, keep reading. If you just want to know which species it is, skip to the end. 1 Leaves without pale pustules, or if present then leaves opaque and do not transmit light; plants glabrate to pubescent. Glabrous is smooth, glabrate means “almost smooth”, and a pubescent area is covered in short hairs. 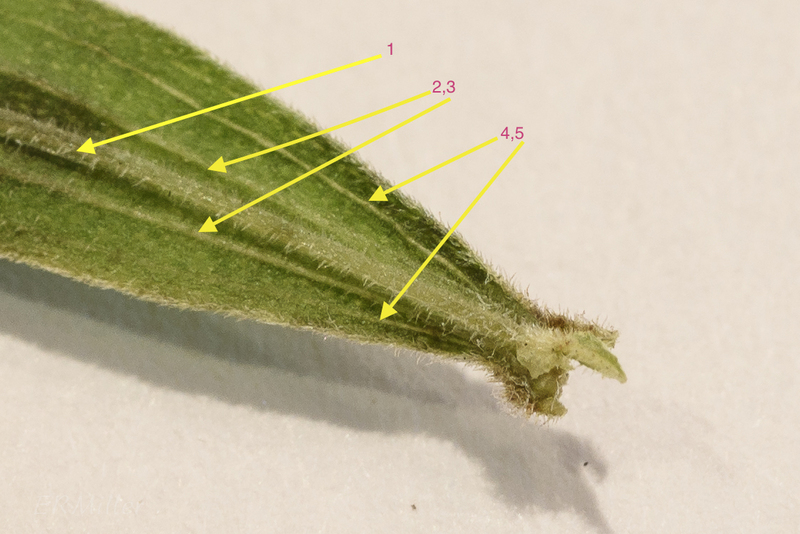 2 Major veins on leaf underside 3-5 (if 3 then all 3 veins bold), leaves 5-12 mm wide; heads with 20-50 flowers. 2 Major veins on leaf underside 1-3 (-5) (if 3 or 5 then only the midvein bold), leaves <6 mm wide (-8 mm wide in E. gymnospermoides); heads with 10-20 flowers. 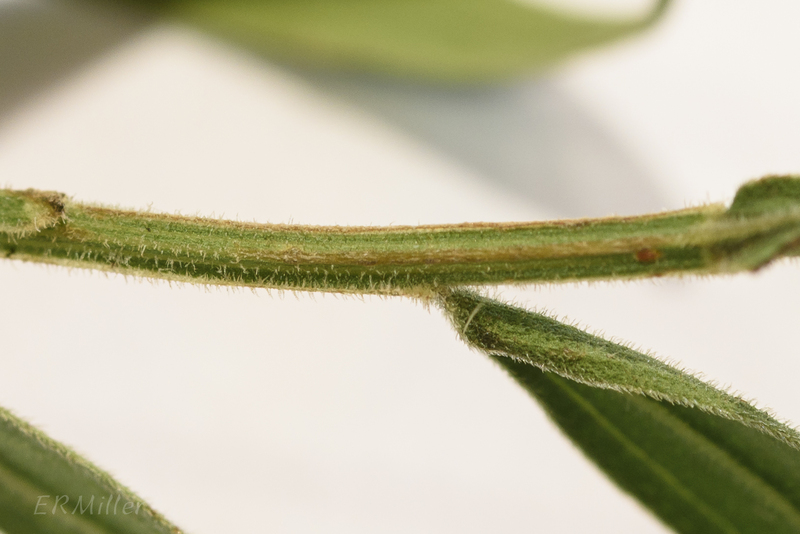 3 Leaves 5-12 mm wide, punctae on leaf upperside obscure or not bold, flower heads 20-50 flowered. 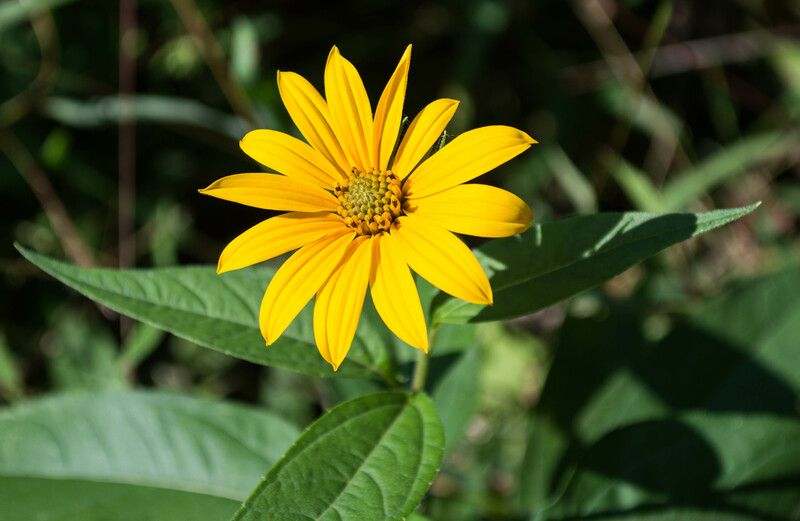 About the flowers… Remember that plants in the Asteraceae have composite flowers. That little thing next to the ruler in this picture, measuring only about five and a half millimeters long, is a flower head – a collection of flowers. At least, it was, as these had all turned to seed. I was able to cut some open and tease out the seeds. 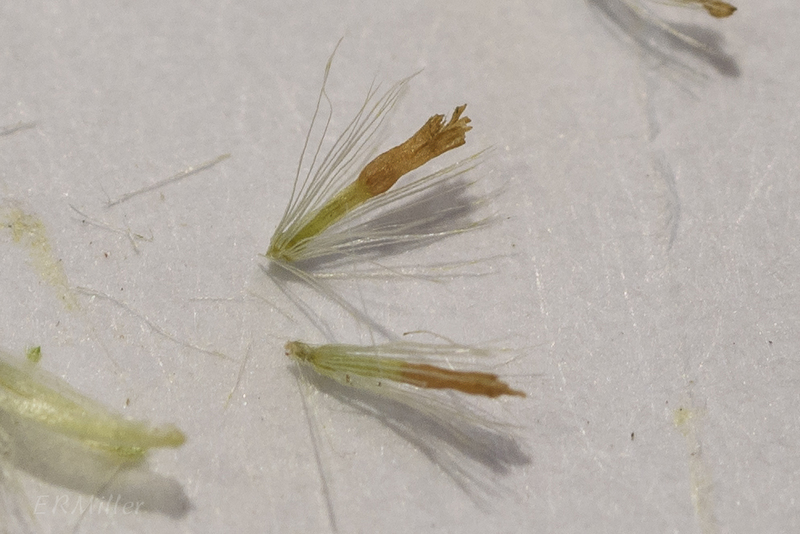 I didn’t count more than 20 in any single head, which suggests about 20 flowers (each flower produces one seed). But, they were minute, and I was working with a small knife and a 10X hand lens, so it’s quite likely my count was inaccurate. Since I couldn’t get a true count of flowers per head, I ignored that part of the key. So there it is. My mystery grass-leaved goldenrod/goldentop is Euthamia graminifolia var. nuttallii. Readers of this blog will have noticed that I am fascinated by names. It isn’t enough for me to spot a plant and say “that’s a goldenrod”; I need to know which goldenrod, the actual species name, what other common names there might be for it and what the Latin words translate to and how it relates to other species… and pretty much anything else related to its taxonomy. No plant has led me into taxonomic Wonderland like this one —>. I first saw it at Serpentine Barrens Conservation Park, in late August in bud, then in October in flower (kind of). Right away I recognized it for a goldenrod, yet it looked a little different from other goldenrods. The flower heads weren’t in plumes or in the leaf axils like other goldenrods I know. So I took a few pictures, went home, and opened the books. 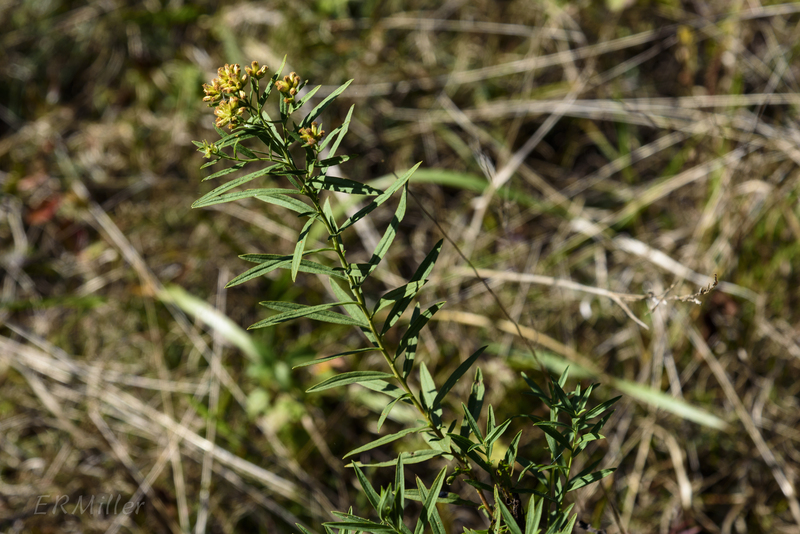 It was easily categorized into “flat-topped goldenrods”, sometimes known as goldentops, for which Newcomb lists two Solidago species and Peterson lists four; Clemants and Gracie list two Euthamia species and two Oligoneuron species. Hmm. Time to open more books. Fleming, Lobstein, and Tufty, in Finding Wildflowers in the Washington-Baltimore Area (1995), report seeing “lance-leaved goldenrod (Solidago graminifolia)” in the area where I found this plant (they call the area the Potomac Power Line). At this point I had tentatively decided that what I found and photographed would currently be called Euthamia graminifolia. I decided to run it by a few experts for confirmation. That’s when I learned that Euthamia is a “problem genus”. Now I was really interested in learning what was going on, so I consulted a bunch of internet sources, and that’s when things got a little crazy. In short, the USDA PLANTS Database lists six Euthamia species, not all of which are found in the Maryland Piedmont. BONAP lists five, only one of which is in the Piedmont. MBP lists four, only one of which is in the Piedmont. ITIS recognizes four species, and lists thirty-six Latin synonyms for E. graminifolia. Thirty-six! Euthamia is a genus of flowering plants in the aster family, Asteraceae. They are known commonly as goldentops and grass-leaved goldenrods. The species were formerly classed in genus Solidago, the goldenrods. 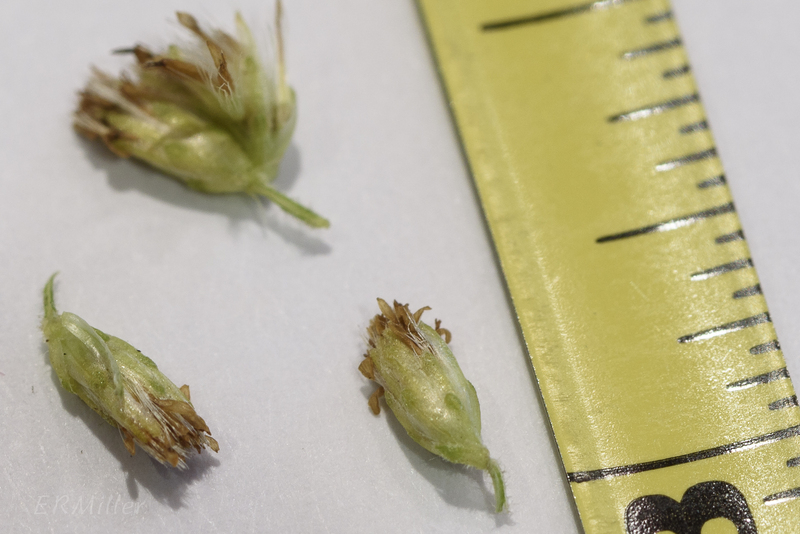 They were separated on the basis of morphological differences, such as the arrangement of the flower heads in the inflorescence and the glands on the leaves, and of DNA data. Authors have recognized 5 to 10 species. Euthamia… is a small genus of erect, herbaceous perennials native to North America. Sierren (1981) revised the genus and recognized nine eastern species and one western species. Haines (2006 Flora North America) recognized only five species. Euthamia was incorrectly included in Solidago by many authors for a more than a century. Cronquist (1981) accepted the distinct generic status for this group of species on the basis of morphology and leaf anatomy (Anderson and Creech 1975). 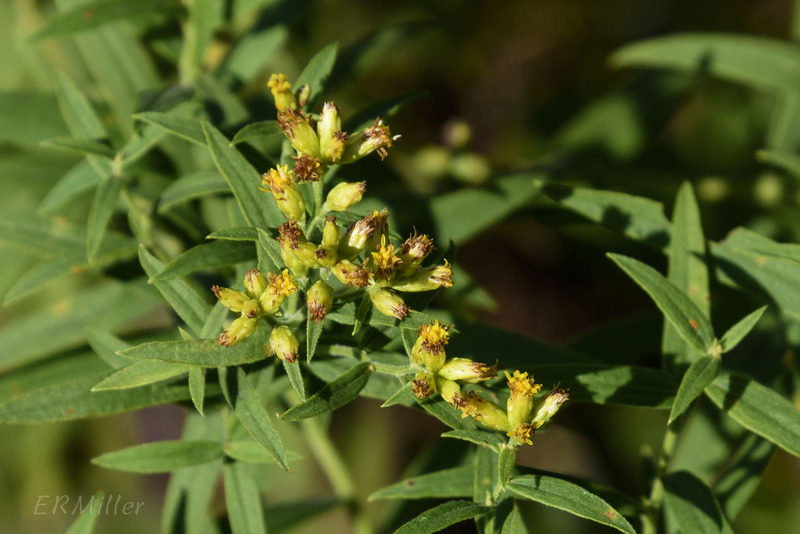 Unfortunately, the practice of placing the grass-leaved goldenrods in Solidago continues and leads to errors in interpreting the results of ecological studies. A genus of about 8-10 species, herbs, of North America. There are a number of serious problems remaining in our knowledge of Euthamia.